So on sunny winter day, I decided to opt for 'layering under the dress' trick. I wore an extremely warm Heatgen™ thermal top & leggings (by Marks & Spencers) under this full sleeves floral maxi dress. What I loved about this maxi dress was the dark floral pattern over a softer hue - Dusk Blue. So wintery yet so vivid! Since it was a flowy breezy piece, this sleek belt helped in accentuating the waist. Even though MONOCHROME gives a very Sixties connotation, one can easily sport this black and white trend now by giving it a fresh, modern makeover. Since I was not very keen on pulling out those skinny jeans, jeggings, etc. (yes, I am off them since a couple of weeks) and wanted a more sophisticated yet very on-trend look, that's when these high waisted wide-leg pants came into the scene. An absolute stylish staple, isn't it? She's the yin to my yang, the ping to my pong, the normal to my crazy! Keep your heavy knits at bay, and get yourself into light layers to get through the cool mornings & as the day gets comparatively warm you just get out of them. When everyone relate winters with deep dark tones or neutrals, how about adding vivid colors to your look? 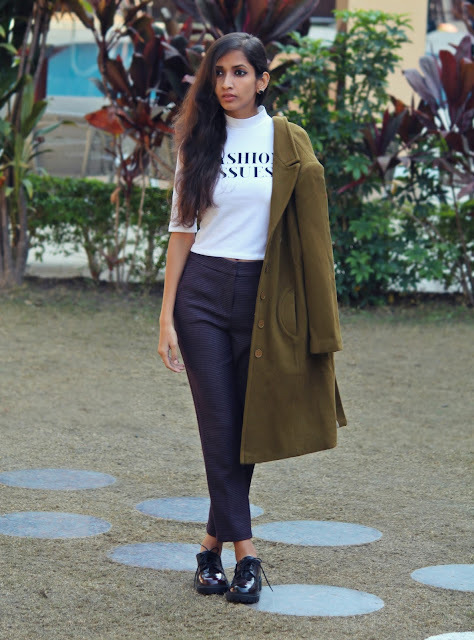 Garima paired her Dark Green basic tee with these slouchy jogger pants! 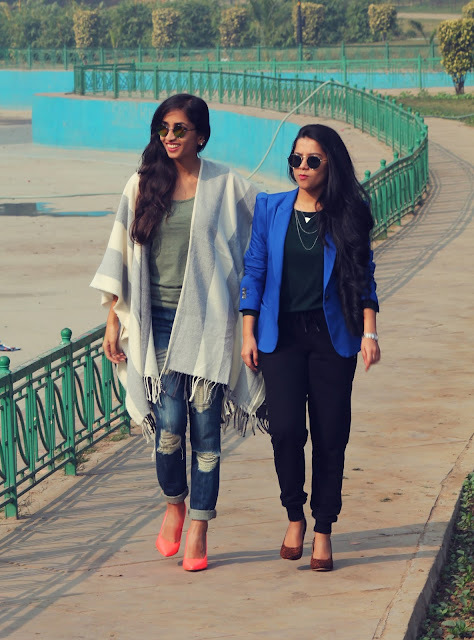 To add a chic vibe to the outfit, she threw on a Royal Blue blazer. Minimal accessories & leopard print pumps, eventually elevated the over all look.